Yes indeed ladies and gentlemen, we bring you the Yamaha REX50! 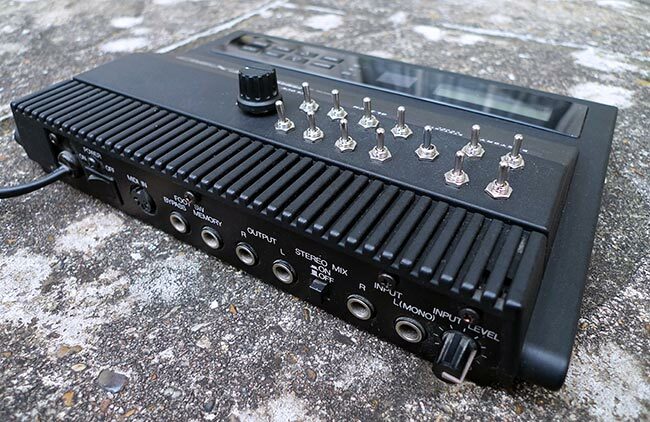 The only multi effects unit ever to have been specifically designed to resemble some kind of 80's nuclear bunker! In that very specific area it excels, but you're really looking in the wrong place if you want high quality studio effects. 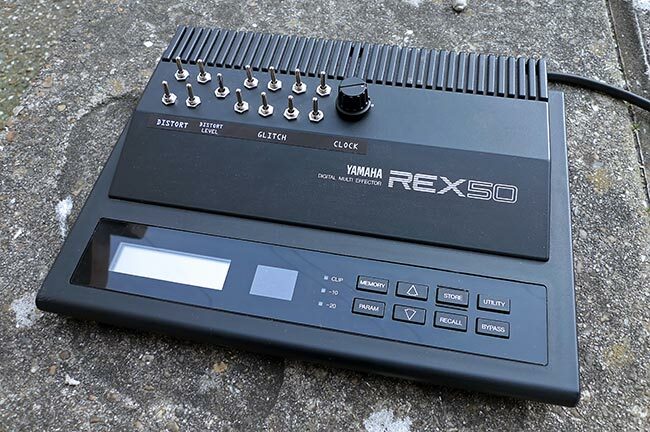 Having said that, the REX50 should not be dismissed, as it is exactly its heroically outdated technology that rescues it from just being another pointless obsolete multi FX unit. 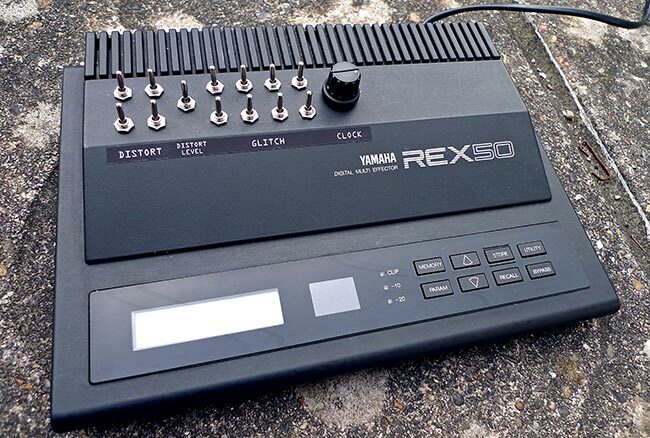 The REX50 was (we think( the desktop version of the rackmounted Yamaha SPX50D, the precursor to the mighty SPX90, which is still very well regarded, and can be found in many professional studios even today. Maybe you won't get sparkling reverbs and spotlessly clean delays, but you will get a bucketful of 12 bit grunge, and one of the most lumpy and yet magic pitch shifters you'll ever hear. The range of 80's reverbs are all present and correct, and theres also a selection of delay and modulation effects, with some digital distortion effects that manage to be both excellent and absolutely atrocious simultaneously. Basically the REX50 is one of those units that you assume is crap, and then 5 hours later you're still fiddling around with it, with an idiotic grin on your face. 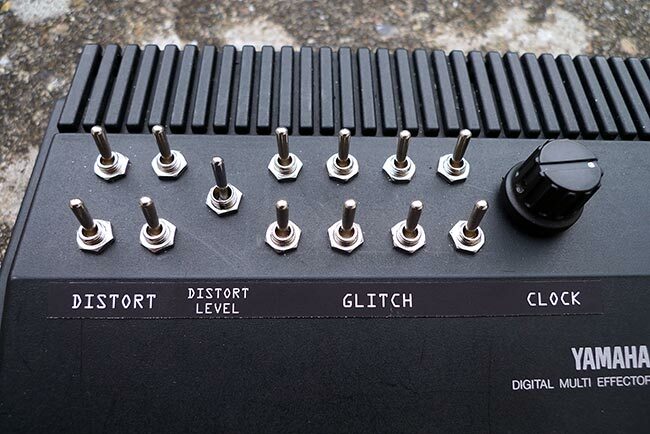 Our mods have added a 12 way RAM decimation switching matrix (4 switches for distortions and 8 for glitching effects), plus another switch that changes the severity of the distortion switches, and a system reclocking knob. The switching matrix operates on any effect that uses the onboard RAM. This includes the reverbs, delay, chorus, flanger, pitch shifting etc. Using various switching combinations it allows you to apply what sounds like a wide range of comb filters, pseudo ring modulation, bit crushing, distortion, and what can only be described as audio smearing™. Each switch has a certain effect variation that is usually associated with it, such as a certain rate of chopping or bit reduction frequency, although its effect can be altered depending on which other switches are activated simultaneously. You have to activate more than one switch at a time for any new effect to be applied, but when two or more switches are activated their associated effects will combine to produce something new. The distortion switches add four distinct levels of distortion to the mix, but can also be used together to produce multiple distortion variations. The distortion level switch simultaneously alters the effect of all four distortion switches from relatively mild, to absolutely savage. The reclocking knob sets the system clock speed of the RAM and the analogue to digital converters. This means it will extend the reverb and delay times to a degree way outside of what would normally be possible. Reverbs can be altered from short metallic ambiances to massive washes of disconnected sound just by turning the knob. Combined with the switching matrix, the reclocking knob has an effect on the preset distortion effects like nothing you've ever heard! Check out the demo below to hear what this thing can do. Take a listen to the demo below to hear the kind of effects that this thing can produce.